Size (inches): 4.72" X 7.09" X 8.46"
These oversized action figures are especially designed for little hands and have large feet to make them easy to stand. These superheroes have unique skills and abilities that they use in their adventures to help others and to explore the world around them. 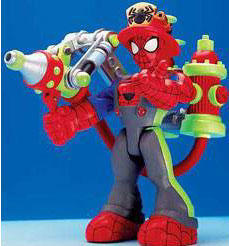 Each superhero comes equipped with a removable backpack and action feature.